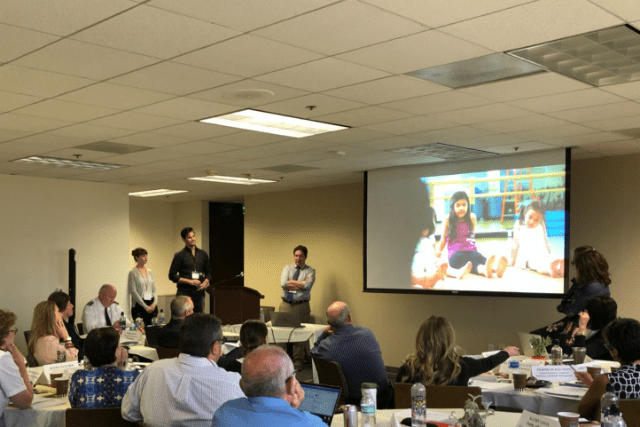 The Salvation Army USA Western Territory hosted its inaugural Communications Summit in Long Beach, California, Aug. 27-28. With leaders from the territory and representatives from various disciplines in attendance—including Multimedia, Public Affairs, Advertising, Program Services, SA Justice, Youth, Emergency Disaster Services, Major Gifts, Planned Giving, Corporate Relations and New Frontier Publications—the summit focused on notable challenges facing the territory and how to collectively develop strategies to overcome them. Territorial Commander Commissioner Kenneth G. Hodder addressed the roughly 50 delegates in attendance. After a brief introduction of the delegates, each department had a chance to share a little about its own communication goals, challenges and successes with the group. Some of those successes included combined efforts, in which multiple departments collaborated to repurpose content for their respective audiences. One example cited was a story developed by New Frontier Publications about a ballet school that offered to come and teach free ballet lessons to kids at The Salvation Army Ray and Joan Kroc Corps Community Center in San Francisco. Once the article ran in New Frontier Chronicle, the content was then repurposed by Multimedia and made into a video feature, which was then spliced up and shared across a number of The Salvation Army’s social media channels. Such collaboration is vital to effectively and efficiently telling The Salvation Army’s stories. With help from the Richards Group, The Salvation Army’s national branding agency, the summit then switched gears to highlight different communication practices that the territory ought to stop doing, keep doing and start doing, based on responses from delegates in the room. Some of the group’s suggestions for improving communication included developing an intranet tool through which to share all pertinent information and resources across the territory; sharing periodic recaps; improving the territorial onboarding process for new hires to strengthen employee buy-in at all levels; and ameliorating some of the communication challenges between Territorial Headquarters (THQ) and its divisions. As Elizabeth Clayton of Richards Group noted, it’s critical going forward to make sure all of The Salvation Army’s communications professionals are working in some capacity to engage the same audience. Hodder noted that he’d like to reconvene with the same group in six months to check in on the progress of each suggestion. Some of those suggestions were delegated to the Communications Working Group, which meets monthly at THQ, while others will be reviewed by THQ cabinet members. All in all, Hodder thanked the delegates for a fruitful two days, and expressed optimism for what lies ahead.